[ACT](VC) Limit Break 4 (This ability is active if you have four or more damage):[Counter Blast (3)] If you have four or more rear-guards with "Battle Sister" in its card name, draw two cards. [CONT](VC):During your turn, if you have four or more rear-guards with "Battle Sister" in its card name, this unit gets [Power]+4000. ...so now we have the new boss for Battle Sisters. I have to admit that this one just leaves me asking for more just by the Limit Break alone, but I guess beggers can't be choosers. It's Limit Break (and other effect for that matter) requires at least 4 Battle Sister rear-guards (so practically a full field), and 3 Counterblast all just to draw 2 cards. 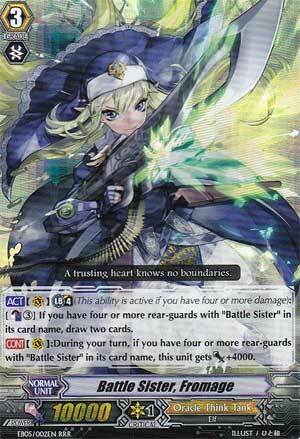 The other effect of Fromage is that she gains 4,000 power if you have 4 or more Battle Sisters on your rear-guards. The unfortunate part is that most players are actually going to take the time to wipe out the opponents' front line. In short, this card wouldn't've been in Gold Paladins, but not Oracles. Next time...more Nuns with Guns!! !